Powering personalized scalable solutions is a central part of our offering at Snaps. Today, we’re excited to introduce entry and exit conditions: powerful, flexible, and reusable components that allow you to define conditions right in our authoring tool. Entry and exit conditions run before a message is rendered or upon input from a user. 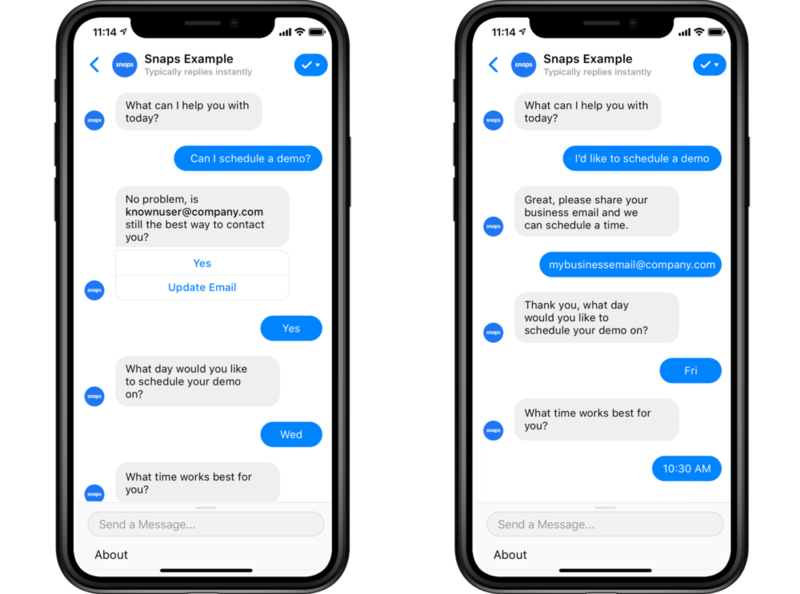 They are designed to further equip non engineers with the ability to author contextually aware experiences that personalize the flow of a conversation. In the examples above, each user triggers the lead generation flow by asking to schedule a platform demo. Entry conditions enable you to check if you’ve already gathered information about a user, and if you have, send them to the next question in your flow. Exit conditions help us define context and create smarter experiences. In the example above, a user is given information about a recently placed order and is asked if there’s anything else they’d like assistance with. When the user triggers a “no” intent in this part of the conversation, we can now respond with a confirmation and a brief NPS survey. Both of the examples above are possible in the Snaps platform with custom code, however at Snaps we are committed to empowering knowledge workers with the tools they need to personalize, test and optimize experiences. To learn more about how to configure entry and exit conditions, refer to our knowledge base. To learn more about how your company can create and launch one to one conversations at scale, schedule a demo.